Today (Saturday 17th) is the last day you can access the videos of the first international OneNote conference (#ONConf2016) for free. Now there are more than 20 talks in total, so there is a lot of material for you to enjoy! Please continue reading for info on support on getting access to my video, and obtain great support tool to view and use it with ease! To access the video, contact me via form below! But then there is this thing with video: it can be frustrating if it goes not fast enough, or it is not covering the exact topic you like. On the TED site they solved this with an interactive transcript which is great. You click on text in the transcript, and the video jumps to that location and plays. A “Notes” column, where you are invited to add comments, remarks, questions etc. I’ll pick it up from there. So best way to view this, is to have the video on one side of your screen, and the notes on the other side. Note: If you add notes, please also add your name there. Please also do not forget to sign the guestbook. So far I have people from Australia, Italy, USA, Ukraine, UK,… signing the list. Please make sure to add your line! 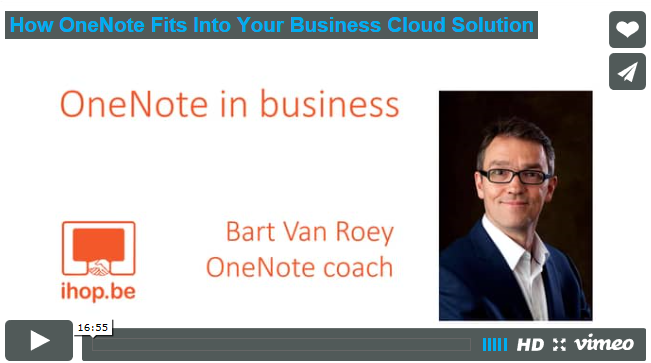 To access the OneNote: please use the link in the email your received from @JaredDeCamp on Wednesday titled: “Bart Van Roey – How OneNote Fits Into Your Cloud Solution“. What is the role OneNote can play in an modern digital workplace? How should an organisation deal with new technology such as OneNote and Office 365 in general. Which digital skills are required from the employees in order to fully profit from the power of the digital collaboration tools. If you are reading this blog post after November 17th (Los Angeles time), you will not get free access to the conference videos any more. You will need some kind of paying access to all the conference videos (which I can provide you with), or get access to my videos via me. Either way: if you are interested in using OneNote in a business setting: contact me by filling in the form below. I look forward to that!